On October 7th, 2016 President Obama signed an executive order lifting trade sanctions on Burma (Myanmar), including the ban on Burmese ruby and jadeite. For the first time in 8 years it is now legal to import these rare gems to the USA. With the end of sanctions and the restoration of democracy in Burma, now is a good time to reflect on just how special Burma is for gemstones, especially ruby. 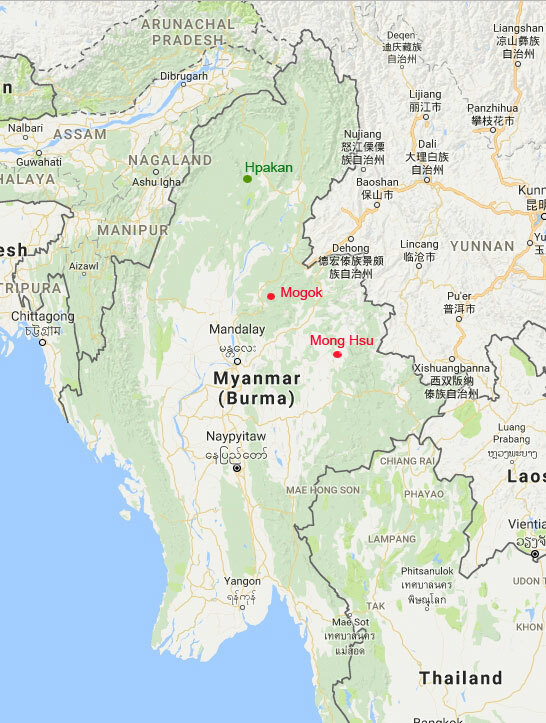 There are several notable mining areas in Burma. The most famous is known as the Mogok Stone Tract, located in northern Burma, about 200 km northeast of Mandalay. The Mogok region has produced exceptional rubies for centuries, with mining activities traced back more than 500 years. Mogok is also an important source of other gems such as sapphire, spinel, peridot, zircon, spessartite and topaz as well as some some very rare varieties such as painite. With the exception of emerald and jade, nearly all gemstone types have been found in the Mogok Stone Tract. The most valuable rubies in the world come from Mogok, the rare "pigeon's blood" rubies. The best Burmese rubies have a fully saturated and pure red with a unique fluorescent quality. Some specimens also have a velvety softness due to tiny inclusions of rutile that are known as "silk" in the gem trade. While Mogok is the most famous location in Burma for fine rubies, many of the Burmese rubies found today actually come from a different location: Mong Hsu in the Shan State. The Mong Hsu deposit was discovered only in 1992, and the deposit was so large that it was hailed as the most important discovery of Burmese ruby for hundreds of years. But these Mong Hsu rubies were not quite the same quality as the famed Mogok rubies -- they had a tendency to a slightly bluish or purplish hue which was not as attractive. However, the color can be improved by heat treatment, so virtually all the Mong Hsu ruby in the market has been heat treated. 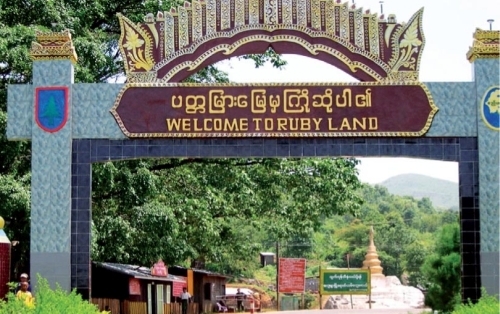 In addition to ruby, Burma is also the source of the world's finest Jadeite. The rarest and most valuable jadeite is called Imperial Jade, colored by traces of chromium. It has color and transparency rivaling fine emerald. You will sometimes hear the term Type A used to refer to jadeite. Type A Jadeite is untreated natural Burmese Jadeite where the color is 100% natural. It is estimated that Burma produces more than 70% of the world's supply of high quality jadeite. The principal jadeite deposits are found in far northern Burma, near Hpakan in Kachin State, about 350 km north of Mandalay. Only a tiny fraction of the jade produced there qualifies as Imperial Jade. This month we feature fine gems from Burma -- Ruby, Jadeite, Spinel, Zircon and Peridot. These will make wonderful gifts for someone special! A big and beautiful top quality pigeon's blood red Burmese Ruby with superb color and intense saturation. The stone is quite clean and brilliantly fashioned, truly a unique treasure. A certificate From GemResearch Swisslab (GRS) stating the color as "vivid red" "pigeon's blood" is included with the purchase of this fine gemstone. An elegant pair of Burmese jadeite dangle earrings, set in 950 platinum with 78 diamonds. Designed by AJS Gems, Bangkok these earrings feature 8 pieces of fine jadeite with a total carat weight of 6.92 carats. All of the individual jadeite stones have been certified as A-Jade (natural and untreated jadeite) by the Gem and Jewelry Institute of Thailand (GIT) and the certificates are included with these fine earrings. A rare gem Spinel from Burma with a lovely medium orangy red color. Beautifully shaped and top quality emerald cut, this is a bright, clean and brilliant gemstone that will make a special piece of jewelry. Guaranteed and natural and untreated. A beautiful large zircon in a vivid deep blue. This is beautiful material, very clean, with good fire. Well cut with excellent luster, this fine gem will set up beautifully in your jewelry design. Guaranteed natural. A fine green Peridot from Burma with wonderful fire. This is a large clean gemstone that has been expertly cut to display maximum brilliance. This peridot really bursts with color from all angles. The cut and polish are both excellent. Guaranteed natural and untreated. A very fine matched pair of high quality Burma rubies, over 1 carat each. The color is a rich deep red with bright red flashes. Clean and well cut, these will make gorgeous earrings for someone special. Guaranteed natural Burma ruby. Christie's sold a pink diamond for $2 million per carat at their Magnificient Jewels auction in Geneva in November. The 9.14 ct pear-shaped diamond, graded fancy vivid pink, sold for $18.2 million to an unidentified Asian buyer. The pre-sale estimated price on the gem was $16 to $18 million. The 10.05 ct Ratnaraj Ruby and diamond ring sold for $10.2 million at Christie's November auction in Hong Kong. The oval-shaped Burmese pigeon-blood ruby achieved the third highest per-carat price ever for a ruby at just over $1 million per carat. The record price for ruby is held by the Sunrise Ruby, a 25.59 ct Burmese ruby which sold for $30.42 million at Sotheby's in 2015. Emeralds derive their vivid color from traces of chromium or vanadium. There are other beryls with less vivid green which are colored by traces of iron. These are known simply as green beryl or, if blue-green, as aquamarine. Yes, we do jewelry projects from time to time for our clients and would be glad to discuss your project with you. We make high quality custom jewelry in 18k gold, handmade by skilled craftsmen in Bangkok. We have saved our clients thousands of dollars on their custom jewelry. You can see some examples in our Jewelry Gallery.